There are a few things that stand out in this world as being unequivocally French. Cuisine for one, fabulous flavours known the world over. Red Wine and Champagne, naturally, and of course Cognac. The king of brandies, famously renowned for its epic history, stringent standards of control, and of course rich, smooth and lingering taste. Cognac itself, is a relatively small region in France, made up of 6 main grape growing regions, the most popular of these being Grand and Petit Champagne. The primary reason it seems, for the popularity of these areas is the limestone, chalky & mineral component of the soil that lends a strong minerality to the grapes, ultimately concentrated through distillation into the final cognac. Fine champagne cognac, with at least 50% of the eaux de vie coming from Grande Champagne, is hailed as the greatest of all Cognacs and shows these strong mineral characteristics in abundance. Try the VS gift Pack, with a free 50ml VSOP – RRP: R299 at leading stores. Which ironically for me, is the main reason (apart from a whopping price tag!) that I tend to shy away from Cognac in general, and gravitate towards the open arms of South African Cape Brandy. Certainly not because Cognac is no good, quite the opposite given its global appeal. But purely based on a matter of personal taste. Down south in our sunny climes, grapes ripen a lot quicker than their northern counterparts, leading to a lot more fruit in the grape when harvested. Take our SA wine for example, much more fruit driven than those from the northern hemisphere. As brandy is concentrated wine, it stands that this characteristic will simply be enhanced through distillation into our beautiful brandy. Full fruit flavours from the grapes, and lovely hints of spice, vanilla, caramel and wood from the oak maturation. And certainly what my palate as a brandy fan is more accustomed to. Which is why sitting down the other night with Bisquit Cognac has been a refreshing eye opener. Cleverly purchased in 2009 by Distell, Bisquit has been growing steadily off the back of increased demand for premium spirits across the African Continent. And when you taste the product itself, you can certainly see why it may be more aligned to the taste buds of the well aclimatised South African connoisseur. It’s definitely one of the more fruit driven cognacs I’ve come across, and really well balanced with spice and sweetness. The minerality so often found in many Cognacs, isn’t over bearing at all in the VS or VSOP variants, and makes for a refreshing change. sweetness at the back of the tongue, almost honey like. And again, the ever present Cognac signature spices of cinnamon and clove. I have yet to sample the XO variant, but from what I hear, and it’s track record at awards shows, it is quite a special blend. 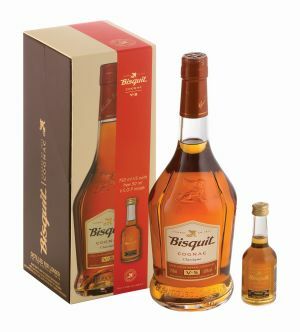 For those who already like Cognac, Bisquit should be a no brainer to try this season. And for the hardened brandy fans, who like me feel that Cognac’s international reputation of bling, and splendour perhaps doesn’t justify its reign over the entire brandy kingdom, this is definitely one that may pleasantly surprise you. After all, that’s the great thing about discovering brandy. Its what you like that matters, not anybody else! Santé!